As CEO Sjoerd Zijlstra is responsible for the overall management of the organization. On the basis of this position, he acts as problem solver, energizer and mentor. An important task consists of exercising due care for the contacts with the outside world. How to realize continuously turning developments within customer and market groups and commercial and technological developments into the development of the organization. In this connection it is important to (keep on) finding a balance between short-term thinking and acting and long-term thinking and acting. Sjoerd is a generalist with an entrepreneurial spirit, who has a proven track record in the businesses services sector. In an engaged way he shapes the development of the organizations in a people-oriented and customer-oriented manner. Sjoerd has been employed at Anker Insurance since November 2007. As from 2011 as managing director/CEO. Apart from being managing director of Anker Insurance n.v. and underlying entities, Sjoerd is also director of Anker Verzekert b.v., Anker Dienstverlening b.v. and Masblanc b.v. 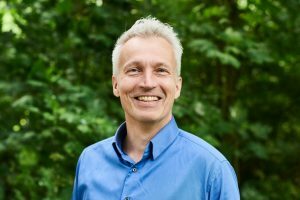 In addition, he is also a member of the board of management of the Stichting Koersvast and he is a member of various committees and working groups. Apart from his work, Sjoerd enjoys riding motorcycles, fitness and attending concerts (underground/alternative).